Graphic design is everywhere. It lurks in book covers, magazines, billboards, product packaging, commercials and websites. It's a means to visually communicate a message to a given audience, whether to sell a product, promote an image, or inform the public. Read on to discover the exciting opportunities to study graphic design in the USA! Graphic design is everywhere. It lurks in book covers, magazines, billboards, product packaging, commercials, and websites. It can pass unnoticed by many who see a pretty image and a catchy slogan without realizing the time, effort, and skill needed to create it. It's a means to visually communicate a message to a given audience, whether to sell a product, promote an image, or inform the public. Graphic design is a perfect mix of creativity and business. First and foremost, be original. Graphic design is a means of getting a message to a mass audience, but in order to do that you'll need to get their attention in a way that no one has ever done before. Graphic design isn't all about you. It involves dealing with clients and supervisors who have their own expectations. You'll need to understand what they're looking for and what you can do to meet their objectives. Can you apply the needs and wants of your client AND get a message across in a clear, concise manner? As computers have become the norm for graphic designers, the need for pen and paper have decreased. However, the ability to quickly sketch ideas for a client, or incorporate illustrations into a design project will always be an added benefit. What has come before you in the world of art? How have others effectively communicated the same idea through art? What design principles did they use? The answers to these questions not only make you more knowledgeable about the industry, but are also a major help for future projects. If the job sounds appealing and the above qualities sound like you, take a crack at graphic design in the USA. International students can expect to take some generalized classes to fulfill college graduation requirements in math, science, foreign languages, psychology and English, for example. However, students who study graphic design spend the overwhelming majority of their time learning the specifics of design. This can include: typography, art history, design theory, color theory, and training for specific design programs. International students interested in studying graphic design in the USA should be aware that graphic designers do not need to be licensed. Certificate Not a degree-earning program of study. Training, lasting from a few months to a year, in the principles of graphic design. While affiliated with colleges or universities, students do not earn a degree. Associate of Fine Arts in Graphic Design A two-year degree at a college or university. Bachelor of Fine Arts in Graphic Design A four-year degree at a college or university. Master's Degree Master of Fine Arts in Graphic Design An additional one to three years at a college or university after a bachelor's in graphic design has been completed. International students should note that while all programs teach the basics in graphic design, employers looking to fill entry-level positions often seek candidates with a minimum of a bachelor's degree. Students who choose to study graphic design should select a school based on criteria important to them, and need not worry about selecting a school that is accredited. 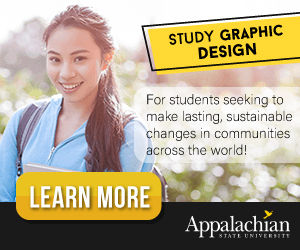 Accreditation is voluntary for graphic design schools. While it is a good means of finding exceptional graphic design programs, there are also excellent programs that are not accredited. Lastly, international students interested in graphic design in the USA should take note of one last thing: the number of titles graphic design and graphic designers can go by. While searching for schools don't rule out majors such as communications design, communication arts, advertising design, visual design or visual communications. Read the details for each major, not to mention that they should be housed in the art or design departments of the university, to erase any doubts. Likewise, graphic designers in the workforce can also be given quite a few titles. When searching for jobs keep a look out for: graphic artist, art director, designer, creative director, production artist, art manager, and web designer. The titles are many and varied so be sure to read the job descriptions. Visit the Study in the USA School search to find schools that offer programs of study in Graphic Design. Over time we will be updating this section and including more information for those who want to study graphic design in the USA and for other countries, but please feel free to post your thoughts and comments on our Facebook fan page, and also follow us and post questions through Twitter.